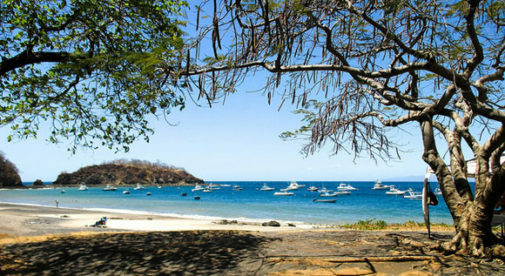 Just 10 minutes’ drive south from the popular tourist destination and expat hotspot of Playas del Coco, is an escape. Playa Ocotal is one of the prettiest beaches on Costa Rica’s northern Pacific coast. It’s a little out-of-the-way but definitely worth the journey to get there. Its off-the-beaten-path location keeps it quiet and uncrowded, as does the lack of places to park. It’s a small cove with high rocky cliffs on each side, with boats anchored offshore bobbing in the swell. There are sport fishing vessels run for tourists—offshore you find swordfish, mahi mahi (known locally as dorado), tuna, and other “game” fish—as well as traditional open boats, called pangas, still operated by local fisherman who head out early each morning and supply many of the local restaurants. You can also hire a boat for scuba trips to offshore reefs that are home to dozens of species of tropical fish, manta rays, sea turtles, and more. If you’re there for the day, there are plenty of spots in the shade of beachfront trees with branches hanging over the sand. With that tropical sun beating down, it’s a welcome respite. And when you run out of cold drinks in the cooler, there’s one beachfront restaurant that offers seafood, burgers, and sports bar fare…as well as cold beer and cocktails. Plan on spending about $10 per person. Every table has a beach view—that’s free. On the hills overlooking the cove are luxury homes with panoramic views of the Pacific—unbelievable sunsets too. They’re pretty pricey. But go just a short walk inland and sacrifice an ocean view, and there are plenty more reasonably-priced housing options. It’s quiet in Ocotal. Things really shut down after dark (which is 5:30 p.m. since it’s so close to the equator). But if you’re up for an evening out, head to Playas del Coco, which has many restaurants to choose from, as well as a full roster of beach bars, sports bars, and live music venues, as well as grocery stores, clothing boutiques, and other shopping.